Te Amo is an exceptionally recognizable brand that serves one of the most popular and affordable Mexican puros: which means, in cigar industry terms, that these cigars are pure – from binder to wrapper – all coming from one country. Their cigars are of the highest quality that demonstrates their devoted craftsmanship of cigar making, all handmade by generation of cigar artisans in the fertile San Andres Valley in Mexico. 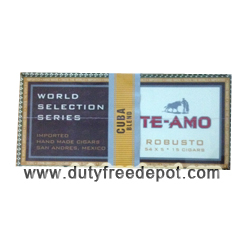 Te Amo premium cigars are a must try for any person who considers himself a cigar aficionado. Shopping for cigars on Duty Free Depot comes with a few advantages over other shopping sites – first and foremost, Duty Free Depot provides the cheapest prices you will find online. Not less important - our policy is to provide Worldwide shipping for all orders! Yes, that's correct each order automatically gets worldwide shipping, not only USA. 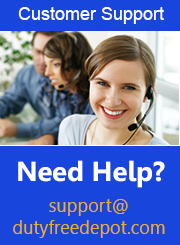 Additionally we have a professional support team for your every need. Order today and enjoy your shopping experience!